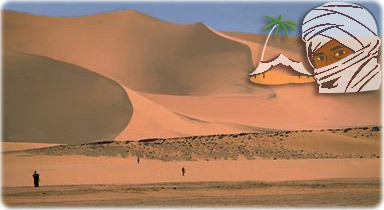 Sahara is a desert plain in the northern part of Africa, covering over 9 million square kilometers, from the Atlantic to the Red Sea. It is responsible for approximately 70% of all barren lands of the world. About one fifth of its surface is formed by extensive sand dune fields. In the past, about five million years ago, there were forests and great mammals living in some regions of the today's Sahara desert. Grand Erg Occidental, North Central Algeria. 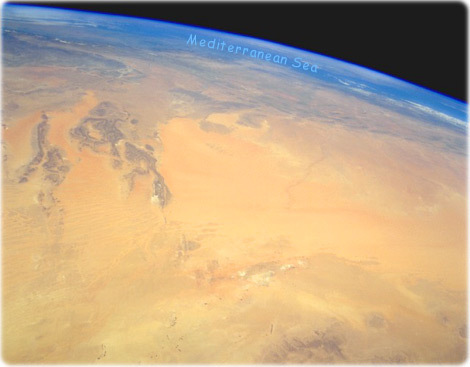 This sand dune region of north-central Algeria is the large sandy-looking area in the center of the photo. This true desert region receives less than 25 cm of rainfall per year. The dark features to the southeast are the northwestern edge of the Tademait Plateau. The small dark specks near the southern edge of the photograph are very small oases and a few isolated circular field patterns (center-pivot irrigated fields). Immediately south of the large sand dunes region are several playas (dry lakebeds) where surface deposits of salt produce a highly reflective surface. The darker landforms near the western side of the photograph are slightly elevated bedrock outcrops whose ridge lines average 610 m above sea level. Near the horizon, the eastern end of the Atlas Mountains is barely discernible (NASA, April 1994).